My son Kai has recently been to Spain a country that I love. I spent fantastic days and nights on Ibiza, my most favorite Island in the world when I was young, and would go there whenever time permitted. 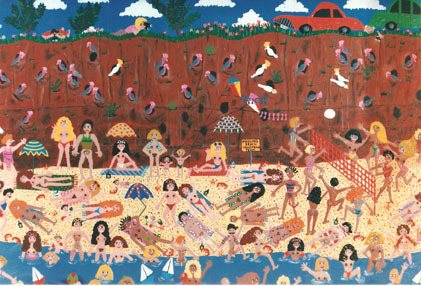 This painting “Let it all hang out” was purchased by the Australian artist Pro Hart and hung in his house. I remember doing a swimwear catalogue in Sitges, the town by the sea that Salvador Dali called home. At the time I was only interested in that fact because my father is an artist and liked his artwork. Now when I think back on that time and remember, I was on Salvador Dali’s doorstep for the most part of a week, doing bikini shoots all day with hairdressers and makeup artists fussing over me and then wined and dined at night. I think, boy I should have paid more attention, what a fabulous opportunity to see and find out more about one of the world’s most amazing artists. Oh well, C’est La Vie, no regrets, it could do your head in to think about all the what’ Ifs’ in life. Till next time, happy painting and sculpting.